K-SOL Project Viewer is our Viewer for Microsoft Project. 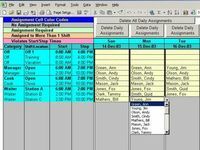 K-SOL Project Viewer is a software application that lets you open, print and export Microsoft Project Plans. 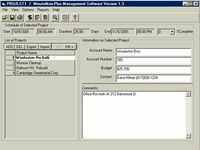 Project Reader can show the projects created with Microsoft Project and stored in MPP format, MPT format, XML format or in database format. 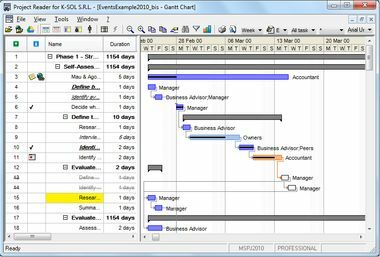 It enables to view the project data in the form of Gantt Diagram, Tracking Gantt, Resource Sheet, Task Usage and Resource Usage. Project Reader interprets the projects stored in MPP 1998, 2000, 2002, 2003, 2007 format, XML 2002, 2003, 2007, in one of the database formats managed by Microsoft Project 1998, 2000, 2002, 2003: MPD, MDB, SQLServer, and Oracle or in one of the Project Server formats managed by Microsoft Project 2000, 2002, 2003 and 2007.